We aren’t quite returning to normal levels of activity here, but we’re getting close. Things have been busy, what with teaching and casewriting and book-finishing. I still need to complete a book manuscript before the blog fully revives, but I do now have some time to breathe. Second, Doug Muir is in Zambia! As always, he writes good stuff. The World of Warcraft reference goes over my head, which actually makes it funnier. He discusses Zambian English (which seems to be just another accent), trade with the DRC (which seems to suffer from a severe lack of transport infrastructure, if I’m reading it right), and the European presence. (I met several white Zambians in Mexico a few years back; they seemed healthily attached to the new country, although their accents seemed vaguely British.) He also tells us that Zambia tried to acquire nuclear weapons. That last is not something that I ever woulda guessed. Doug still refuses to carry a camera, though, for his own strange reasons and which I am sure he will regret in 20 years. Anyway, read the posts, and encourage him to keep it coming. Finally, baseball! Word, baseball. 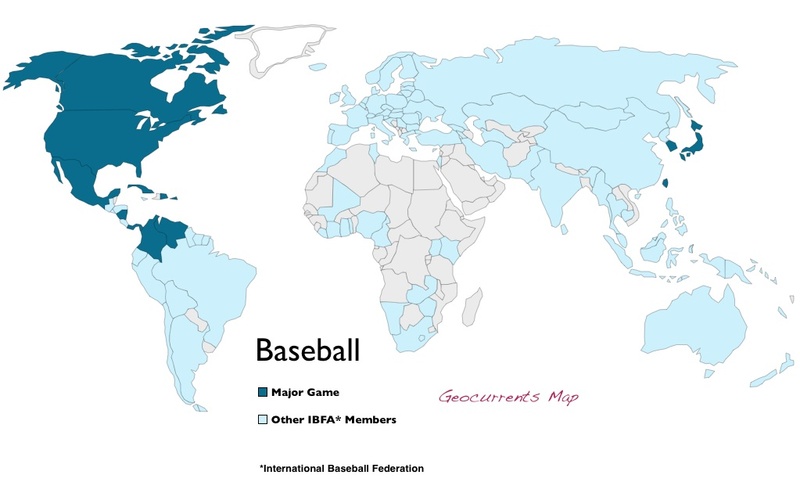 You might think that the sport expanded from the United States at the point of a bayonet, since the map of serious baseball countries looks a lot like a map of the unofficial American Empire circa 1940. But you would be wrong. Still no explanation of why the sport faded out in the Philippines. These are honestly the best series of posts from Doug yet, and that is setting a rather high bar. All they lack are representative photographs. 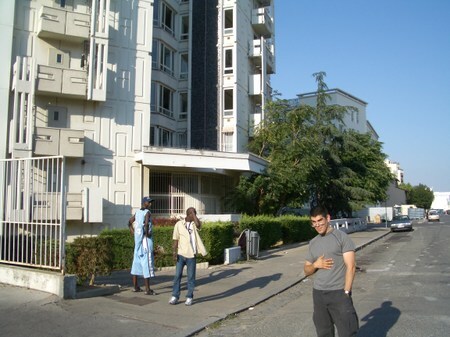 Here Doug visits Katanga. The post details the province's problems, covers some colonial history, and shows why visits to Africa often produce wistfulness and confusion regarding the European empires even among people who hold no emotional attachment to them. In Doug's case, quite the reverse. This post explores a practical question: how do central banks manage to get currency into the hands of people who need it? Money as a unit of exchange is worthless if people with wealth can't convert their stores of wealth into units of exchange. But that turns out to be much more complicated than it might seem. Latin American countries have at times encountered problems of small change --- Argentina recently went through one such episode, and I lived through another in Mexico in the early and mid 1990s --- but I know of nothing on the scale of the problems Doug describes. He also describes a minor miracle in which millions of dollars in cash sits undisturbed and barely protected in a place where one would not expect it to last. Doug also investigates past and present plans to dam or make navigable (these are different) the lower reaches of the Congo River. Mobutu, it turns out, built a massive long-distance power line to move electricity from one of the dams on the Congo (the last of which was built in 1958) to Katanga, in order to make the province dependent on the central government. It didn't work out too well. The whole mess makes me wonder. Did decolonization in Congo have to be such a mess? Was a better outcome at all possible? I know not. But Mozambique suggests that it might have been better. And in the latest, he asks the question: how bad is Congo's government? You won't like the answer, nor the paradoxically Pollyannish (but almost certainly correct) explanation. Also, in recognition of my co-blogger, we now have a Finland tag! Enjoy. Eighty-five years and one-day ago, on December 11th, 1924, the Republic of Finland celebrated a very special anniversary. The state and the military establishment hosted it at the Officers’ Casino Building in the Katajanokka neighborhood of Helsinki. The celebration commemorated the 25th anniversary of the Battle of Magersfontein, part of the Anglo-Boer War of 1899-1902. The conservative newspaper Uusi Suomi (New Finland) advertised the event on its front page, and the periodicals of the Finnish Civil Guard published articles on the conflict between the Boer republics and the British Empire. The celebration opened with the the Finnish Naval Orchestra’s performance of “Kent gij dat volk,” the South African anthem. Among the guests of honor were Lauri Malmberg, the minister of defense, and Per Zilliacus, the chief of staff of the Civil Guard. The Finnish Civil Guard also sent a wreath tied with blue-white ribbons to South Africa, where it was laid at the monument on the battlefield of Magersfontein. Why did independent Finland celebrate a battle fought in a British colonial conflict in South Africa? Simple: Finnish volunteers had fought in the battle as soldiers of the Scandinavian Corps of the Boer forces. The Scandinavian Corps was founded in Pretoria on September 23rd, 1899, supposedly as a testimony of loyalty felt by the Scandinavian immigrants towards the South African Republic. It included 118 men; 48 Swedes, 24 Danes, 19 Finns, 13 Norwegians and 14 other miscellaneous nationalities, mainly Germans and Dutch. In addition, three Swedish women served as nurses in a separate ambulance unit. The Scandinavians fought in the siege of Mafeking and the battles of Magersfontein and Paardeberg; of these, Magersfontein was the most significant. The names of the fallen soldiers are engraved on the shield. Emil Mattsson died in Magersfontein; he’s buried in the field. The British captured Henrik Hägglöf, who died from his wounds at an infirmary near the Orange River. Johan Jakob Johansson — whose name is mistakenly written “Jakobsson” — died at the prison camp on St. Helena and is buried in grave number 18 at the Knollcombe cemetery. The name of Matts Laggnäs, another Finnish volunteer who died in captivity on St. Helena, is missing. My very first peer-reviewed academic article concerned this very topic, and it was published in the Finnish Journal of History a few years ago. Afterwards, I was delighted to note that an Afrikaner fluent in Finnish had read my article and discussed it in his own blog. Reading my own text translated in Afrikaans was an interesting experience. The term “Boer War” was translated as Tweede Vryheidsoorlog, the “Second War for Freedom.” The official term in the Afrikaner historiography for the wars against the British Empire in 1880-1881 and 1899-1901 were the First and Second War for Freedom, and the terms seem to still be in use. Non-Afrikaner South Africans do not seem to use the phrase, understandably enough. The history leaves us with three obvious questions. What significance does the Anglo-Boer War have today, eleven decades after the war broke out? What is the significance of the Finnish Republic’s 1924 commemoration of its citizens’ participation in that war? And what are we to make of the fact that an event considered highly significant in 1924 has been almost forgotten in 2009? These images show the medal that the Russian army minted to commemorate the 1831 conquest of Warsaw. You can occasionally still find these in Finnish antique shops; this one was provided courtesy of Jani Tiainen’s Finnmedals in Helsinki. Before we leave behind the Finnish soldiers who fought on behalf of Russia in Poland back in 1831, there are a few questions left to be answered. What were the consequences of the war for Finland? What were its effects on Poland? In the short term, the Polish campaign of 1831 undoubtedly strengthened the Grand-Duchy of Finland. In the context of the politically incendiary situation in 1830-1831, the Finnish Guard’s participation in the Polish campaign played an important role in securing Imperial favor for the Grand-Duchy’s autonomous status. At a time of crisis, Finland demonstrated to the Russian Empire that (unlike Poland) she could be trusted. For the Finnish officers who had distinguished themselves on the front, the campaign marked the beginning of some splendid careers. Adolf Aminoff, the young lieutenant from the painting in the fourth part of the story, rose to the rank of General of Infantry and ended his career as an adjutant of Alexander III. Henrik Lyra, whom the Poles captured at Długosiodło, became a General Major. The young Casimir von Kothen became the adjutant for Governor-General Aleksandr Sergeyevich Menshikov, and later the governor of the province of Viipuri. And finally, Colonel Ramsay, the commander of the Guard, became General of Infantry and a member of the Russian Imperial War Council. In short, over the decades preceding the Crimean War, the government of the Grand-Duchy of Finland was in the hands of officers who had earned their ranks on the battlefields of Poland. From Russia, without love? Or a Greek tragedy? There is no official definition of “depression.” Tim Kehoe says a 20% deviation from trend growth over a decade. Richard Sylla says double-digit unemployment for a period of months. Brad Delong says unemployment staying in double-digits for three years, or peaking above 12%. Michael Bordo says a two-year continuous output decline of at least 10%. By any of those definitions, Finland suffered a depression in 1991-93, or even 1991-96. So what caused it? Well, there was a discussion about that somewhere, but I can't find it. Anyway, you can sum up the evolution of the conventional wisdom as follows: “We thought it was the collapse of the Soviet Union, but then we figured out that it was actually caused by a banking crisis.” Blaming it on the Soviet collapse exculpates Finns: it all came from Russia. Blaming it on the banks turns the episode into a Greek tragedy, which Finns unknowingly brought upon themselves. Now, however, a Ukrainian, a Mexican, and an American have entered the fray to argue that, no, it was indeed the sudden collapse of trade with the Soviet Union what caused the Finnish depression of 1991-96. Their paper is here. The argument is pretty simple. (1) Yeah, there were some signs of financial weakness before 1991, but let's not get crazy. (2) Trade shock. Huuuuuge. Plus, when you look at the industries that went under first and fastest, it was the ones that relied on the Soviet trade. (3) The banking system didn't fall apart until after the trade shock. Absolutely, it was a weak system, but few systems could have handled a shock that big. Basically, they argue that you don't have to assume a lot of friction in the real economy to get a slow recovery from a trade shock of the magnitude that hit Finland in 1991. But there is that nagging question: why did Sweden go into a (much less serious) recession around the same time? Could the Soviet trade shock have precipitated the Swedish crisis somehow? Or is all just a coincidence, kind of like a man getting hit head-on by a truck and then having a bicycle ride over his hand? It's an interesting paper, even if it turns out to be wrong. Thoughts? Elsewhere in Europe, the bloody suppression of the November Insurrection aroused, well, different feelings. The Polish independence struggle became an immediate cause célèbre for European liberals. Casimir Delavigne, for example, celebrated the old Napoleonic brotherhood in arms between France and Poland in his exhilarating song La Varsovienne. In the German-speaking countries, August von Platen’s 1831 sonet collection Polenlieder topped what later generations would call the charts. West European sympathy towards Poland, however, hardened Russian attitudes; even the Russian intelligentsia abandoned its criticism of the Tsarist régime and supported Imperial policy in Poland. The anti-European backlash culminated in Aleksandr Pushkin’s legendary (if somewhat unsubtlely-titled) poem, “To the Slanderers of Russia.” Pushkin’s diatribe, in particular, should be familiar to a modern reader. Russian officials still reference “To the Slanderers of Russia” in times of conflict. During the 1999 Kosovo War, for example, the Russian foreign minister, Igor Ivanov, cited the poem in order to give a stern warning to the NATO countries. Eight years later, in 2007, the Russians once again used the poem for propaganda purposes during the Bronze Warrior crisis between Estonia and Russia. The work of art that you see below is a painting by Robert Wilhelm Ekman, a pioneer of early national romantic art in Finland. Ekman is perhaps best remembered for his early attempts at the illustration of Kalevala, but this work, finished in 1848, invokes the memory of the Finnish soldiers who had fought and died in Poland seventeen years before. You won’t find this work on display in any museum; it is part of a private collection, and the owner prefers to keep it that way. The painting depicts the young lieutenant Adolf Aminoff wounded on the ramparts of Tykocin on May 21st 1831. As you can see, the painting captures two ideals. First, an officer who leads his men from the front, even at the risk of his own personal safety. Second, his soldiers, equally ready to risk their lives by rushing to the aid of their wounded comrade. During the following decades, national romanticism claimed these universal ideals as quintessentially Finnish military virtues. Emphasizing the importance of solidarity and camaraderie is always a natural choice. After all, it doesn’t really matter what you’re theoretically fighting for, because putting your life on the line for your comrade is always a virtue. The soldiers of the Finnish Guard joined the other units of the Russian Imperial Life-Guard in Białystok on April 11th, 1831. By this time, the Polish-Russian war had been raging for two months, and the insurrection was spreading, with violence and mayhem escalating on daily basis. On the same day as the Finnish soldiers listened Colonel Ramsay’s lecture on the Russian War Articles and the letters of protection issued to the Polish civilian population, one Russian cossack regiment massacred civilians in the small Lithuanian village of Oszmiana. The event was subsequently commemorated in Adam Mickiewicz’s epic poems. Diebitsch’s army crossed the frontier on February 5th, fully prepared to crush the Polish rebellion. Resistance, however, proved to be a good deal tougher than anticipated; as mentioned before, the Congress Kingdom had a large, professional standing army, which now proved its mettle. On February 25th, the Poles halted the Russian advance in the bloody battle of Grochów. The Poles then began a counteroffensive. Lieutenant-General Ignacy Prądzyński, the Polish chief of staff, defeated the Russians at Dębe Wielkie on March 31st, and again at Iganie on April 10th. But wars, like baseball games, aren’t over until they’re over. We continue the story from December 14th, 1830, when the Finnish Guard received its mobilization orders and started to prepare for a long and arduous journey to the Polish battlefields, on behalf of the Emperor and the Fatherland. [The “Fatherland” would be Finland, not the Russian Empire, right? In our hemisphere, we’re not used to those distinctions, except maybe the Canadians. And the West Indians. And the Puerto Ricans. And the Colombians. And … oh, never mind. —ed.] However, before we describe the Finnish participation in the suppression of the Polish independence struggle in any further detail, it’s perhaps best to describe those men who ended up serving as tools of the Imperial Russian war machine in the said campaign. What kind of a unit was the Finnish Guard, and what do we know of its officers and soldiers? I write about history. As said, I’m single, but Clio is a very demanding mistress. [My wife is very understanding of that, and it's one of the many reasons I love her. —ed.] As for my field of study, you could probably say that I’m more interested in Power than Money. [One often begats the other. —ed.] I specialize in military history, in a very broad sense. Two months ago, an article that I wrote on the interned Polish soldiers in Finland in 1940-41 appeared in a publication of the Finnish National Archives, and just recently, Studia Historica Septentrionalia published another article that I wrote on the theme of comradeship-in-arms. 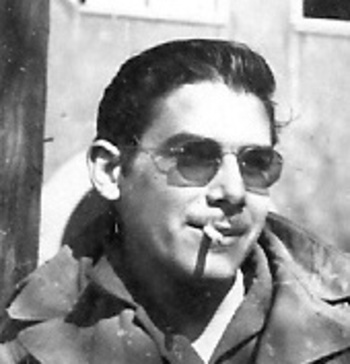 In particular, however, I’m interested in soldiers who have, for one reason or another, ended up serving in the military establishments of foreign powers — usually, in the service of their Imperial master, occasionally in the service of its enemy, or sometimes even in conflicts where there appears to be no vested national or ideological interest whatsoever. I’ve written articles on the Finnish volunteers in the Boer War, Finnish volunteers in the Waffen-SS, and also a biography of jäger colonel Eino Polón, Knight of the Mannerheim Cross. For those who don’t know, the term “jäger” refers to the Finnish independence activists and volunteers who served in the Imperial German Army against Tsarist Russia in 1915-17. But what was this so-called “Finnish Guard?” What exactly happened in Poland in 1831? And how did it create such long-standing differences between the two border countries? Ah, with Finnish allusions enveloping the blogosphere, it is good to get some perspective. Then, a historical film from 1952 about the geopolitical challenge. Back to the Revolución Bolivariana, next post. Me, I love France in that peculiar way that (I like to believe) only Americans can. So much of the place reminds me of home! But still, I gots to punch the myths. The latest one I've run into is that France has discovered a way to make nuclear technology pay that doesn't involve huge dollops of taxpayer money. As with so many things, the proof comes from Finland, a country I really have to visit soon. Now, I want to make clear that I am not opposed to spending large dollops of taxpayer money on nuclear energy. I am agnostic. But I am pretty clear that such is what needs to be done in the absence of serious carbon caps, high carbon taxes, of further run-ups in the price of fossil fuels, because nuclear power plants are just plain expensive and very hard to build. Frex the saga of the Areva reactor under construction in Finland. As of September 7th of last year, it had already run 25% over its €3 billion budget and had its opening delayed at least two years. Bloomberg quoted Robin Kendall, director of project finance at Société Générale: “You have to go in with your eyes wide open.” Poor Société Générale is one of the banks that lent €1.95 billion euros to the Finnish national utility for its new reactor. The Finns refused to pay Areva for the overruns, which has blown a hole in the French company's bottom line. Were the banks just stupid? Is Robin Kendall an idiot? Have super-canny Finnish negotiators stiffed hard-working French financiers? The answers are no, no, and no. Rather, the French government guaranteed the loans that the Finnish utility took out to finance its share of the project ... and French taxpayers may yet wind up eating the losses. Under an Obama Administration, a real cap-and-trade system (you, know, with caps) may make subsidies and guarantees unnecessary. And even if it doesn't, subsidies and guarantees may in fact be a good idea. But at the current state of play, they're very necessary to make nuclear economic ... and without carbon caps or taxes, subsidizing nuclear power seems like an unwise use of limited public resources.